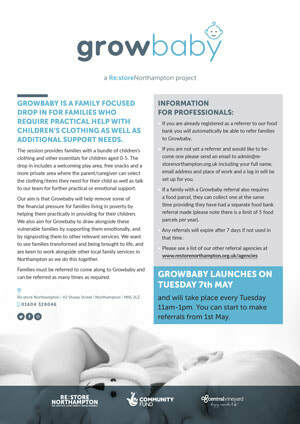 GROWBABY IS A FAMILY FOCUSED DROP IN FOR FAMILIES WHO REQUIRE PRACTICAL HELP WITH CHILDREN’S CLOTHING AS WELL AS ADDITIONAL SUPPORT NEEDS. THE SESSION PROVIDES FAMILIES WITH A BUNDLE OF CHILDREN’S CLOTHING AND OTHER ESSENTIALS FOR CHILDREN AGED 0-5. Families must be referred to come along to Growbaby and can be referred as many times as required. You can download an up-to-date list of things you can donate here. If you would like to donate clothing and other items, you can drop them to us on Tuesdays between 11am-3pm. If you are a professional, you can read more information here. Be kept up-to-date with all thats going on at Re:store Northampton. We promise not to pass on your details to any other organisations.